Tim then replaces the defective part from components usually purchased locally, and verifies that the performance of the circuit is better - again using his in-circuit tester. He then marks the replaced part with a red dot - to show the replaced part, and returns the fixed SMS card to spares. Tim's in-circuit tester Notice on the left that the driving frequency is 60 Hertz, power line frequency - much lower than the service frequencies. 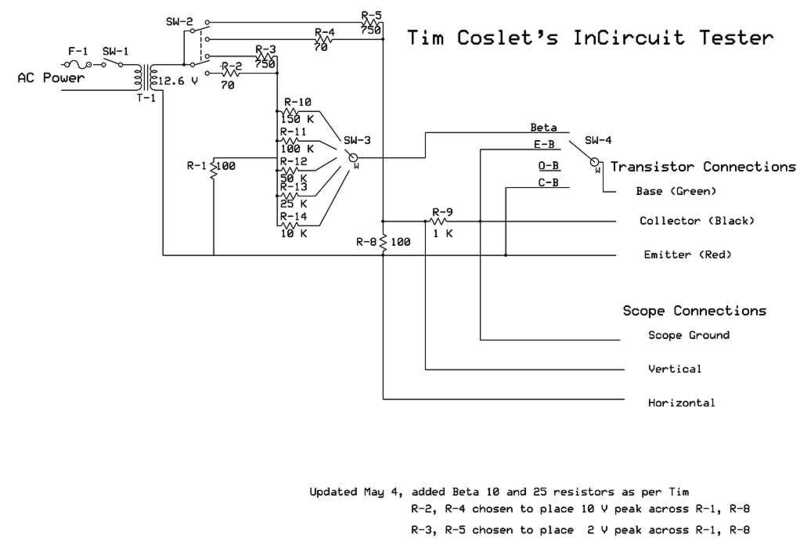 - Tim's test probes are marked "Collector (Black)" and "Emitter (Red)" in the diagram. - The outputs from this circuit "Horizontal" and "Vertical"
are fed into the x and y axis of an oscilloscope that Tim brings with him. This is an expanded re-draw of the above - trying to get ready to make a duplicate of Tim's box. 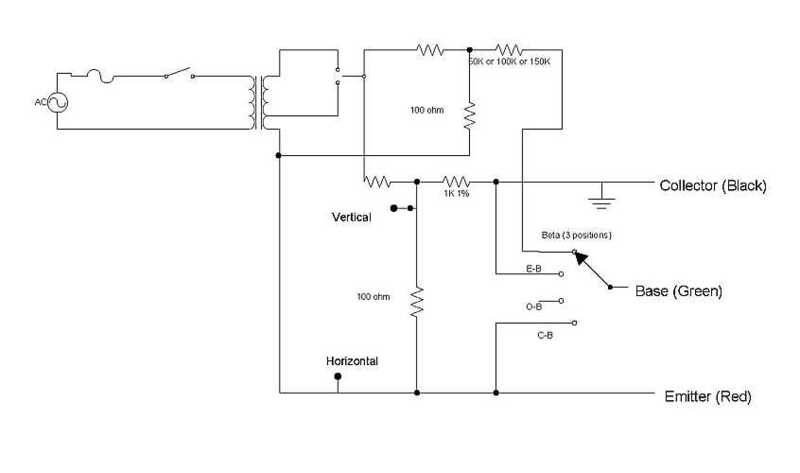 At the test frequencies and the resistances involved, the capacitors are practically open circuits and inductors are practically short circuits. These "reactive" components should not make phase changes (loops) in voltage vs. current curves at the much lower test frequency compared with the service frequencies. A person expects straight lines from resistances, and sharply bent lines from transistors and diodes. The original design in the magazine used +-1V peak to avoid possible damage to semiconductors during in circuit test, but this is too small to turn on darlington transistor E-B junctions so I increased my design to +-2V. I also added a +-10V peak range to check reverse breakdown, low voltage zeners, and operate transistors at higher voltages. All the 1401 testing has been done on the +-10V range, as this seemed more "realistic" to me and I was having problems getting good Beta estimates on the +-2V range (due to an effect mentioned below almost all the transistors read very low Beta on that range, but more normal Beta on the +-10V range). The scope was not set to 1V/div. I usually use 0.5V/div when using the +-2V range and 2V/div when using the +-10V range (so the curve fits the screen better). Unless I need to determine transistor type (Si/Ge) or breakdown voltages I'm more concerned with shape than exact voltage/current levels. E-B is the Emitter-Base junction with the Collector shorted to Base. O-B is from Emitter to Collector with the Base not connected (open). C-B is the Collector-Base junction with the Emitter shorted to Base. These are standard test definitions given in datasheets that I wired into my switch, so that I would not have to keep swapping leads around. The Beta settings use an additional similar resistor network to inject current thorough the Emitter-Base junction while the main circuit is measuring the characteristics of the Emitter to Collector path (similar to the O-B measurement, but with the Base connected instead of open). The difference in the additional similar network is that the 1K resistor is replaced by a Beta*1K resistor (50K, 100K, and 150K in my box) and there are no scope connections to that circuit. To a first approximation, if the resistor selected exactly matches the Beta of the transistor then the curve drawn will be identical to the curve drawn in E-B mode, if the resistor selected is larger than the Beta of the transistor the curve drawn falls outward, if the resistor selected is smaller than the Beta of the transistor the curve drawn pulls inward. However this is never exact as the test circuit has no compensation for the E-B diode characteristics (a second approximation effect that changes between transistor types) and the curve sometimes begins falling outward then pulls inward. This references the August 1975 issue of Popular Electronics, which is almost certainly where I got it originally.